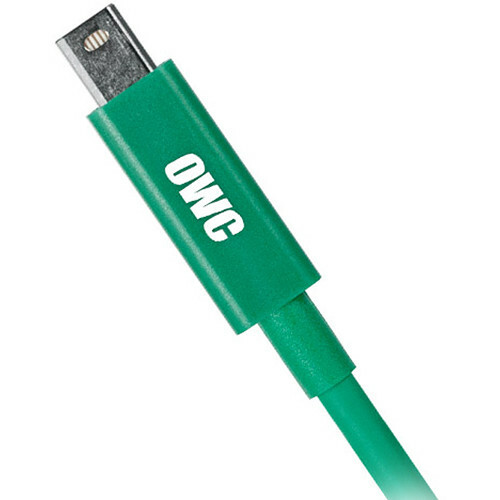 The green Thunderbolt Cable from OWC / Other World Computing has a length of 6.6' and is designed for Thunderbolt-based production workflows and data needs. It enables you to connect Thunderbolt-equipped systems with Thunderbolt-compatible peripherals, such as hard drives, displays, video capture devices, docks, and more. This cable is compatible with 20 Gb/s Thunderbolt 2 technology and 10 Gb/s Thunderbolt technology, offering bi-directional channel bandwidth for both standards. Thunderbolt technology also supports 4K video transfers and workflows, as well as 4K displays via DisplayPort 1.2 video outputs. Box Dimensions (LxWxH) 4.8 x 4.7 x 0.5"
Thunderbolt Cable (6.6', Green) is rated 5.0 out of 5 by 7.